At the end of March 2015, Kevin Murray Associates facilitated a ‘continuity workshop’ for the Glasgow Canal Regeneration Partnership (Glasgow City Council, BIGG and Scottish Canals) to update all stakeholders on the position of Port Dundas and to workshop the next steps together. Presentations were made Kevin Murray and members of the Partnership by way of update following the successful Port Dundas Charrette in 2014 along the canal corridor, Sighthill, 100 Acre Hill and the forthcoming Supplementary Planning Guidance for the area. Workshop groups discussed the priorities and key delivery partners required to take things forward under the following themes: transport and movement; infrastructure, energy and SUDS; public realm and streetscape; urban form and open space; economy and business; and community and housing. Discussion highlighted the importance of connecting the area into the city, with emphasis on how the edges of the area function in this important re-connecting role. The mixed-use aspiration was also important, as the area has slowly been a successful business location and can continue in this vein, even as it transitions into a mixed neighbourhood with housing and community facilities. Importantly however, it was affirmed that this area is a major opportunity for innovation, both in terms of the businesses that might occupy the place and in the procurement of housing through innovative models. 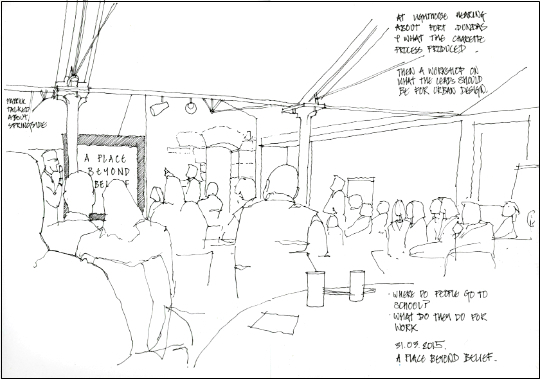 The sketch above is by Sandy Morrison of HTA, who are undertaking urban design and masterplanning work on 100 Acre Hill. More of his sketches can be found here. The report from our 2014 Port Dundas Charrette can be found through the Scottish Government Charrette Mainstreaming page here.